This article deals with the nuts-and-bolts of converting a conventional road or mountain bike into a fixed gear. There are four ways you can go, as far as hubs are concerned. You can use a track hub, a flip-flop hub, a freewheel hub, or a cassette hub. The best set-up for a road fixed-gear is to build up a new rear wheel, using either a track hub or a flip-flop hub. Track hubs have a stepped thread. The main thread that the sprocket screws onto is the same as that of a normal freewheel hub. Outboard of this, is another threaded section of slightly smaller diameter. This thread is a left (reverse) thread, and a special lockring screws onto it. After you screw the sprocket on in the normal manner, and tighten it down securely, the lockring screws down so that it presses against the outer surface of the sprocket. If the sprocket should start to loosen up, it will try to turn the lock ring counter clockwise...but that only tightens the lockring. As a result, the sprocket cannot be unscrewed by the chain, no matter how hard you fight the pedals. lip-flop, or double-sided hubs are threaded on both sides. Usually one side has a track-type threading, (with lockring) and the other side is threaded for a single-speed standard freewheel. It is possible to find them with track threading on both sides, but not easily. The usual way to use a flip-flop hub is to have a fixed gear on one side, and a single speed freewheel on the other. Ideally, the freewheel sprocket would be one or two teeth larger than the fixed sprocket. You would ride with the fixed gear most of the time (I hope!) and save the freewheel for longer rides, or for getting you home when you are tired. Having the freewheel a bit larger than the fixed sprocket gives you a lower gear when you are using the freewheel. This makes it easier to climb. Since you can coast when you are using the freewheel, the lower gear is no disadvantage on the descents. Single-speed freewheels are commonly used on BMX bicycles: most shops that deal in BMX parts should stock them. The common size used for BMX is 16 tooth. Other sizes may be hard to find, especially for 3/32 chain. If you are going to use a flip-flop hub with a freewheel, you should have two brakes on the bicycle. Fixed/free, this is the type I speak of above, with a "track" side and a freewheel side. he cheapest way to convert a multi-speed bicycle into a fixed gear is to use the original rear hub, assuming that it is made for a conventional threaded freewheel. A fixed sprocket will thread right on, but there is no provision for a left-threaded lock ring. If you go this route, it is a good idea to use LocTite or a similar thread adhesive. You can use an old lockring from a British-threaded bottom bracket as an additional safety measure, it is the same thread. Although you can just screw on the sprocket and put everything together, the chainline will probably be incorrect. If you go this route, you will usually need to re-arrange spacers on the axle to correct the chainline, then re-dish the wheel so that everything will track correctly. I should mention that there are those who say you shouldn't use a lockring. This theory is based on the fact that if the chain should come off the chainwheel and get caught, a sprocket without a lockring will just unscrew, rather than locking up the rear wheel. My feeling is that it is better to use a lockring so that you can rely on being able to slow the bike down with your feet, especially if you ride with only one brake. If you don't use a proper track hub with a lockring, you really should have two hand brakes. If not, a front brake failure followed by a sudden extra effort at "resisting" could break the sprocket loose at the worst possible time, and you'd be toast! It is also possible to convert a Shimano cassette Freehub ® for fixed-gear use. Quality Bicycle Products used to make the "Surly Fixxer (formerly Sub 11.0) Hub Converter", an adapter that replaces the Shimano Freehub body with a rigid aluminum block that is threaded for a fixed sprocket and lockring -- unfortunately, no longer made, though you might still snag one in old stock. This device is mainly intended for use with disc wheels and the like. Although it works with most Shimano cassette Freehubs, it is expensive enough that it doesn't generally make sense unless you already have a very good wheel that you don't have any use for as a multispeed. Bruce Ingle, a fellow member of the Charles River Wheelers used a Shimano cassette hub, which he immobilized by brazing the ratchet mechanism together. I rode with a brazed-up cassette hub for quite a while, and it worked fine. Track hubs generally come with solid axles and track nuts. This is because most velodromes have rules requiring this type of wheel attachment. As a result, it is widely believed that quick-release axles are not suitable for fixed-gear use. This is false! It is my belief that the velodrome rule dates back to long before the invention of the quick-release, when the choices were standard nuts or wingnuts. The protruding "wings" of wingnuts might constitute a hazard in a crash, and I believe that's why the rule was instituted. Since quick-release skewers don't have any sharp projections, that becomes a non-issue in practice. If you are going to use a quick release with a fixed gear, you should make sure to use a good quality enclosed-cam skewer. t is very desirable that a frame for fixed-gear use have "horizontal" rear dropouts: that is, the slots in the frame that hold the rear axle should run in a more-or-less horizontal direction. This allows you to move the axle back and forth as needed to adjust chain tension. This makes things much easier than if you try to convert a newer bike with vertical dropouts. The most desirable bikes for fixed-gear conversion are 1970's road bikes. These usually have horizontal dropouts, and usually don't have unsightly shift-lever bosses. Frames of this era also tended to have more generous tire clearance than newer sport bikes, providing more versatility in the choice of tires, and the use of fenders. ld three-speeds can also make quite satisfactory fixed gear bikes, particularly English ones. The rear triangle is already just about perfect for a track hub; they usually have 110 mm spacing. The better English 3-speeds had pretty nice-riding frames, and can be very pleasant bikes for not a lot of money. If you replace the 590 mm (26 x 1 3/8") wheels with 622 (700C) wheels, the bottom bracket gets raised a useful amount, providing good ground clearance. Using the larger wheels also allows you to install a better, shorter-reach brake caliper. There is a limit to the width of a 700C tire that will fit under the fork crown, especially with fenders, but relatively narrow tires are usual on a fixed-gear bicycle. One of my favorite fixed-gear bikes is my 1916 Mead Ranger. This was originally built as a coaster-brake bike with 28-inch single-tube tires on wood rims. It was wheelless when I bought it at a flea market, so I set it up with some nice quality '70s vintage 630 mm (27") wheels and modern tires. It's surprisingly pleasant to ride. 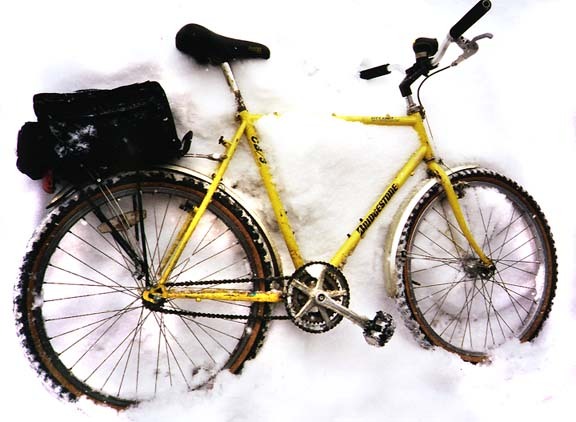 I have an old Bridgestone CB-3 set up for nasty winter conditions, with a 28/15. This gives a nice low gear, a 3.63 gain ratio (49" / 3.88 m) which will take me as fast as I care to go when the streets are snowy. A fixed gear this low makes the brake almost unnecessary: such a low gear lets me slow the bike down quickly by resisting, especially considering that it can't go very fast. I have set up a couple of mountain bikes with flip-flop hubs, so that I get a fixed gear on one side and two different freewheel gears on the other. This is done with a double chainwheel and a two-speed freewheel. (The freewheel is actually an old 5- or 6-speed freewheel with 3 of the sprockets replaced by spacers. Road...when I'm tired, or hilly areas. The 52/30 and 42/20 combinations are not usable due to chain length. I change gears manually...yes, I have to stop to do it, so I don't do it that often. You CanNOT use any sort of pulley type chain tensioner on a fixed gear bike! You cannot use a derailer on a fixed gear bike, even as a chain tensioner, because when you resist the rotation of the pedals, you would bend the derailer. This presents a problem if you want to use a frame with vertical dropouts as a fixed gear, because there's no easy way to adjust the chain tension. This is also true of chain tensioners sold for singlespeed coasting bikes, such as the Surly Singleator. Even the chain tensioners used for downhill mountain bike racing are not strong enough to withstand the stress of resisting the pedals. These tensioners have to clamp on to the chainstay, which is more or less round. There is no way to make one that would be secure, short of installing some sort of brazed-on fitting. Solutions to this problem are described in a section of our article on non-derailer drivetrains. Please read the entire page, as it also describes other important topics with fixed gears. Frames built originally to be used with 5-speed freewheels usually have 120 mm spacing between the rear dropouts. Fixed gear hubs are commonly available in this spacing, although they are more commonly found in the narrower, 110 mm spacing which is standard for track hubs. If you are using a newer frame, with wider spacing, you may want to replace the axle. You may want to replace the axle in any case, because fixed gear hubs generally come only with solid axles, not quick release. any track bicycles use a wider chain than is common on multi-speed bicycles. Derailer-type chain has a nominal internal width of 3/32". Most bicycles without derailers, including most fixed-gear bicycles, use the wider 1/8" size. You can buy fixed-gear sprockets in both widths. There is more about chain in our article on non-derailer drivetrains. An important note: only master links for 1/8" chain can be detached and reattached without loosening the wheel -- so, 1/8" chains are easier to remove for cleaning. erailer bikes can work fairly well even with the chain running at a considerable angle, but this should not be done with a fixed-gear setup. It is quite important to get the chain line just right. This topic is addressed at more length in our article on non-derailer drivetrains. There is more detailed information on chainline in my Bicycle Glossary's Chainline Entry and even more in my Chainline Article. he chain tension on a fixed gear is quite critical, and is regulated by moving the rear axle back and forth in the fork ends. If the chain is too tight, the drive train will bind, perhaps only at one angle of the pedals (chainwheels are not usually perfectly concentric). It should be tight as it can be without binding. If the chain is too loose, it can fall off, which is quite dangerous on a fixed gear. This topic is addressed at more length in our article on non-derailer drivetrains. Special equipment choices are required if the frame has vertical dropouts. You need to pay more attention to chain wear on a fixed-gear bicycle than on others, because the consequences can be more serious if the chain falls off. If the chain is badly worn, adjusting it just short of binding will result in rough running and low efficiency, because the chain will not engage the teeth of the sprocket evenly. Check the chain for wear, readjust the position of the rear hub and replace the chain as needed. Unfortunately, fixed-gear riding is somewhat of a fringe activity from a commercial point of view, and those who have not learned to love it tend to write fixed-gear fans of as nuts and fanatics. If you have a local bike shop that stocks fixed-gear stuff, you are in a lucky minority, and I urge you to patronize them.